All 14 European hostages held by Algerian militants in the Sahara for more than five months have been freed, Mali's presidential spokesman has said. "We confirm officially that they have been released, all the hostages," spokesman Seydou Sissouma announced from the capital, Bamako. The nine Germans, four Swiss and one Dutchman were among 32 tourists abducted by suspected Islamic extremists in southern Algeria earlier this year. They were later moved to Mali, where intense negotiations were conducted to get them released. 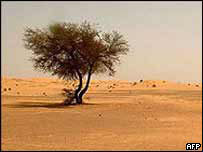 The German foreign ministry confirmed the news from Mali. German Deputy Foreign Minister Juergen Chrobog said: "The Malian president told me that all the hostages are freed and they will be in Bamako tomorrow (Tuesday)." Dozens of journalists are on stand-by at Bamako's airport to witness the tourists' arrival. The BBC's Tristana Moore in Berlin says the nine Germans are expected to fly home later on Tuesday. She says the hostages are reported to be safe and well, though exhausted. Algerian commandos freed 17 of the 32 hostages in May. Algeria said the kidnappers belonged to the Salafist Group for Preaching and Combat, which is fighting for a purist Islamist state. 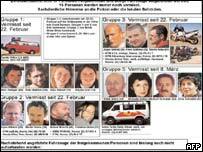 The German press has reported that the kidnappers wanted $5m for each hostage as well as security guarantees. The Malian Government has been conducting talks with the kidnappers through a mediator - local Tuareg leader Iyag Ag Ghali. Germany's ZDF television said a Malian negotiator had given a ransom to the hostage-takers. It said the money did not come from the German Government. Heatstroke is thought to have killed one of the hostages, a 45-year-old German woman. The kidnappers have kept the hostages on the move from one remote hideout to another in a desert where temperatures can reach 45C. "The hostages had been moved frequently"